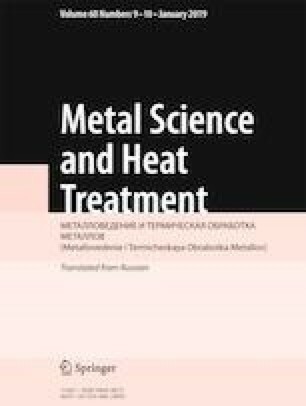 The effect of laser surface alloying with nickel and manganese on the structure, phase composition, microhardness, and fretting resistance of the surface of titanium is studied. Treatment modes improving the structure and properties of the surface layers of titanium are determined. Translated from Metallovedenie i Termicheskaya Obrabotka Metallov, No. 9, pp. 36 – 40, September, 2018.